Subscribe to this box here. I love these little hand-made terra cotta chakra aromatherapy discs from Soul Candy by Amy Logan Life and Art. Put a drop or two of your favorite essential oil blend on the white part, and it holds the scent. You can place them around your house, use them to meditate, or carry them in your pocket. The scent lingers and if you place them near you (such as at your desk), you'll notice your favorite aroma throughout the day. ​The stones are $39 for a set (on sale for $25 now), which includes 7 discs stamped with each of the seven chakras and glazed a corresponding color. It's a cute, creative, and portable way to have your favorite aromatherapy blend with you wherever you go. This subscription crate and the crystals box in my previous post are my first foray into the world of subscription crates. They are fun - like getting a little surprise gift - especially if the theme of the box is something that really interests you. For people who are just starting in metaphysics and crystals, it's a good way to add to your collection and learn about crystals and other metaphysical items. My plan is to try a few months of each subscription before moving on and trying something else, as there are multiple metaphysical subscription crates (and crates specifically focused on crystals) available. That way, I can give you the information you need to decide which boxes you'd like to try. So watch for more to come. Note: I say in the video the box was $45 - but it is $33. I actually really like everything in it, especially the Munde roll on, which smells like ginger and supports success, and the lavender spray. I look forward to a second month to see what they send. Find it here. I have several oracle and tarot decks because when I do readings for myself or others, not only do I randomly draw a card, but I also randomly draw a deck (or have the person I'm reading randomly draw one). For me, this really helps focus the reading. I'm always excited to check out new decks and add them to my collection. 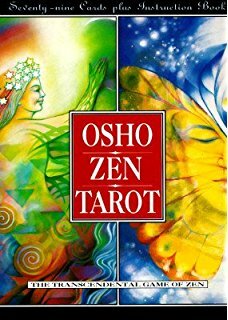 Still, with multiple decks, the Osho Zen Tarot is both my oldest and my favorite. I like it so much it's the only tarot deck I also have on my smartphone. The cards are beautifully illustrated, and they have a lovely and positive (Zen) focus. I have the app, which is $7.99 on iOs and Google Play, and it is totally worth the cost. The app will randomly draw a card for you every day - you can set the time (I like 8 AM), and it will send you a push notification that your daily single card reading is available. I use this as a daily point of focus. On the app, you can also select multiple single-card readings with different focuses, or there are several layouts, as well. Osho has a few other decks (both hard copies and apps), and I have all of them. None live up to the beauty of the art and the simplicity of the concepts in this deck, however. I notice the deck seems to be out of stock everywhere; I hope it hasn't been discontinued. But if it has, the app is still available. You can also do a free daily card draw or spread by visiting the Osho website. I highly recommend you do. Funny (but true) story. I was doing a reading for a friend who often has unusual events occur in his life. He randomly drew this deck, and then randomly drew the card The Master. ​While I typically use only a single card as the focus for the reading, occasionally I have the person draw a second card from the same deck for clarification. I asked my friend to draw a second card with the first card still sitting face up on the table where we could both clearly see it. He pulled out another The Master card. What's funny: I've used the deck for years, and it only had one The Master card. Later, I checked the deck again, and it contained only one The Master card. So that's weird, but apparently that day, the deck was sending a very powerful message to my friend.